I so love this idea. Artist Luke Jerram is bringing a little levity and lightness to the sweltering summer streets of New York City. 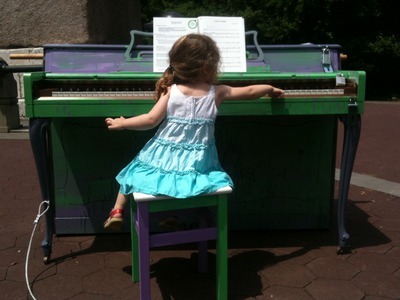 From now until July 5, his work, Play Me I’m Yours is in the big city capturing imaginations. 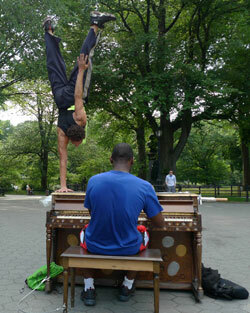 He has placed 60 pianos throughout New York’s outdoor spaces for anyone to come along and play for a while. The pianos are available for you to tickle the ivories from 9:00AM – 10:00PM every day, and locals and visitors alike are loving it. The artist has done similar projects in the UK, Sydney, Australia, and in Sao Paulo. Young, old, rich, poor, from Chopsticks to Beethoven, folks are taking a moment or several from their busy days to play and listen. It becomes a gathering of strangers, initiator of smiles, and chance to find yourself entertained and entertaining as others bust out into song, dance, and that wonderful you-wouldn’t-believe-what-just-happened spontaneous sense that makes New York so special. What unexpected lightness can you add to your day and the day for others?